This atomic-resolution simulation of a two-dimensional peptoid nanosheet reveals a snake-like structure never seen before. 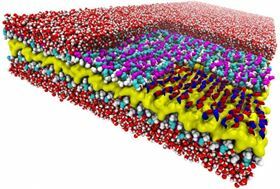 The nanosheet's layers include a water-repelling core (yellow), peptoid backbones (white) and charged sidechains (magenta and cyan). The right corner of the top layer of the nanosheet has been ‘removed’ to show how the backbone's alternating rotational states gives it a snake-like appearance (red and blue ribbons). Surrounding water molecules are red and white. Image: Ranjan Mannige, Berkeley Lab. Scientists aspire to build nanostructures that mimic the complexity and function of nature's proteins but are made from durable and synthetic materials. These nanostructures could form the basis for incredibly sensitive chemical detectors or long-lasting catalysts, to name just a few possible applications. But as with any craft that requires extreme precision, researchers must first learn how to finesse the materials they'll use to build these structures. A discovery by scientists from the Department of Energy (DOE)'s Lawrence Berkeley National Laboratory (Berkeley Lab), and reported in Nature, represents a big step in this direction. The scientists have uncovered a design rule that permits a recently created material to exist. This material is a peptoid nanosheet, a flat structure only two molecules thick composed of peptoids, which are synthetic polymers closely related to protein-forming peptides. The design rule controls the way in which the polymers adjoin to form backbones that run the length of the nanosheets. Surprisingly, these polymer molecules link together in a counter-rotating pattern not seen in nature. This pattern allows the backbones to remain linear and untwisted, a trait that makes peptoid nanosheets larger and flatter than any biological structure. The Berkeley Lab scientists say this never-before-seen design rule could be used to piece together other complex nanosheet structures and additional peptoid assemblies such as nanotubes and crystalline solids. What's more, they discovered it by combining computer simulations with x-ray scattering and imaging methods to determine, for the first time, the atomic resolution structure of peptoid nanosheets. Whitelam is a staff scientist at the Theory Facility at the Molecular Foundry, a DOE Office of Science user facility located at Berkeley Lab. He led the research with co-corresponding author Ranjan Mannige, a postdoctoral researcher at the Molecular Foundry, and Ron Zuckermann, who directs the Molecular Foundry's Biological Nanostructures Facility. They used the high-performance computing resources of the National Energy Research Scientific Computing Center (NERSC), another DOE Office of Science user facility located at Berkeley Lab. Peptoid nanosheets were discovered by Zuckermann's group five years ago. They found that under the right conditions, peptoids will self-assemble into two-dimensional structures that can grow hundreds of microns across. This ‘molecular paper’ has become a hot prospect as a protein-mimicking platform for molecular design. To learn more about this potential building material, the scientists set out to determine its atomic resolution structure. This involved feedback between experiment and theory. Microscopy and scattering data gathered at the Molecular Foundry and the Advanced Light Source, another DOE Office of Science user facility located at Berkeley Lab, were compared with molecular dynamics simulations conducted at NERSC. This research revealed several new things about peptoid nanosheets: their molecular makeup varies throughout their structure; they can only be formed from peptoids of a certain minimum length; they contain water pockets; and they are potentially porous when it comes to water and ions. These insights are intriguing on their own, but when the scientists examined the structure of the nanosheets' backbone, they were surprised to see a design rule not found in the field of protein structural biology. In nature, proteins are composed of beta sheets and alpha helices. These fundamental building blocks are themselves composed of backbones, and the polymers that make up these backbones are all joined together using the same rule. Each adjacent polymer rotates incrementally in the same direction, so that a twist runs along the backbone. This rule doesn't apply to peptoid nanosheets, however. Along their backbones, adjacent monomer units rotate in opposite directions. These counter-rotations cancel each other out, resulting in a linear and untwisted backbone. This allows backbones to be tiled in two dimensions and extended into large sheets that are flatter than anything nature can produce. "We also expect there are other design principles waiting to be discovered, which could lead to even more biomimetic nanostructures," adds Zuckermann.